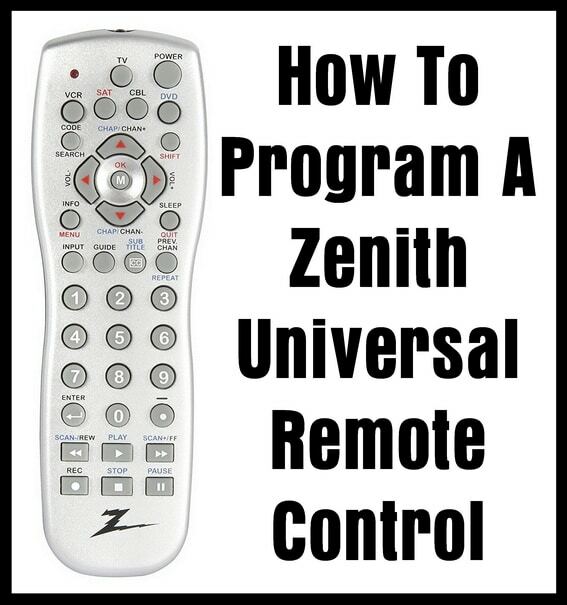 Here is how to program a Zenith Universal Remote Control. There are 2 ways with most Zenith remotes. You can either use a remote code that will work with the component you are going to setup, or use the CODE SEARCH button on the remote to auto find the correct remote code. Usually using the remote code manually is the fastest way as long as you have the correct remote code. See the links to the right (or on the bottom of this page if you are looking for a Universal TV Remote Code) to find the code numbers you may need to program a component to work with your Zenith remote control. 2 – Using your Zenith remote control – Press and hold the “CODE SEARCH” button and wait for the small light to illuminate. 3 – Once the small light on the remote illuminates, release the “CODE SEARCH” button. 5 – Now press and release the (EX: DVD, SAT, CAB, AUX) button for the media device you are programming. 6 – Find out the code you need for the media device you are setting up. 7 – Once you have found a list of remote codes for the media device you are programming… Enter the 3, 4, or 5 digit remote code into the remote using the number keys. 8 – The small light will turn off once a code is entered. 9 – Now check to be sure the remote code you entered into the Zenith remote is the correct code by pressing CHANNEL UP, VOLUME UP, OR POWER OFF to see if the code you entered is the correct code. 10 – If the media device responds, then you have entered the correct code, if not, keep trying different remote codes by following the same procedure above. 6 – Scroll through the codes that are already programmed into the Zenith remote by pressing either the “POWER” button or the “CHANNEL UP” button. 7 – Keep pressing the “POWER” or “CHANNEL UP” button until you find a code that works. 8 – When you find the remote code that works with your media device simply press the “MUTE” button to save the code. 9 – If you find a code that works but you scroll past it, you need to press the “CHANNEL DOWN” button to go backwards to the previous code. Need help? Let us know if you are having trouble programming your Zenith remote control and we can help. Leave your question below. I am not a seller, but I am looking for the exact same remote you were: for the Zenith XBV713 combo player. I ordered two remotes online, and neither one worked. Did you find one, or did you get a universal remote? Thank you. Looking for a compatible remote control for R1P081V for VCR/DVD player – model XBV713 – DVD Player + Video Cassette Recorder.